Could this consumer staple giant really be in for a long, slow decline? There's a good argument it is. Procter & Gamble Company (NYSE:PG) is a stalwart of the stock market and is often cited as one of the market's best dividend aristocrats. Its consumer staple business is at the foundation of a dividend that's been paid to investors for 126 straight years and increased each of the last 60. However, business has changed a lot in the last decade, and P&G has seen a slow decline in operating results. What's driving that decline and the changing face of retail may be bigger concerns than investors are currently pricing into the stock. P&G has long been a powerhouse in the consumer staple business. Its power wasn't because it had better products than competitors, necessarily, it was because it commanded so much shelf space and marketing power that it could crush smaller competitors. There's a reason Tide takes up so much space on store shelves with different scents and formulations; Procter & Gamble wants to crowd out everyone else, and it uses its size to do so. The problem is that retail is rapidly changing in ways that erode P&G's power in the market. Today, you can buy shavers, socks, underwear, diapers, toothpaste, and even toilet paper directly from the manufacturer or product companies. And they'll deliver it straight to your door. This essentially levels the playing field in retail and allows small, innovative product companies to compete with the big guys. I recently highlighted how this is an impossible battle against the internet that retailers may only be able to delay, not stop entirely. And it's affecting Procter & Gamble's financial results already. The competition will eat away at P&G's results in two ways: through taking revenue and eating away at margins. 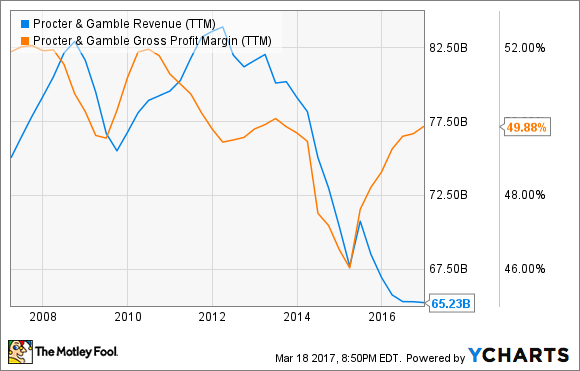 You can see the trend of both below (partly affected by divestitures hurting revenue). Unless something changes, I think this trend will continue. P&G will have a hard time growing in a market that's already saturated with its products and is seeing new competition from smaller, more innovative businesses. And with distribution muscle losing its power in the age of the internet, the company may be in for a long, slow decline. A lot of investors buy P&G's stock for its dividend. And when you consider the fact that the business in general is in decline, that dividend could be in trouble. 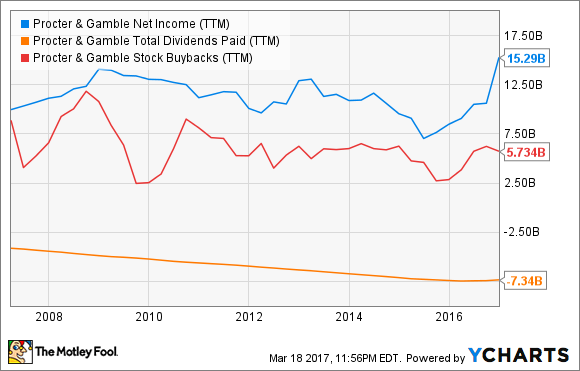 The chart below shows the company's net income, dividends paid, and money spent on share buybacks. You can see that if it weren't for a one-time gain of $5.3 billion last quarter on the sale of its beauty brands business, the company would be spending more on dividends and buybacks than it makes in net income. Eventually, either net income has to improve, or the money being returned to shareholders has to come down. And if the business overall is in decline, the dividend investors have gotten for 126 straight years -- and that has increased for 60 straight years -- could be in a bit of trouble. Despite the challenges I've outlined, the market doesn't seem to be very worried about the stock. Shares trade at 24 times current year earnings estimates, higher than the 21 P/E ratio for the Dow Industrials Index as a whole. As the distribution power the company was built on subsides, there may be more to worry about than investors are currently pricing into the stock.